I found this information in my clip file which I built while I was a reporter at The Romeo Observer in Romeo, Michigan. 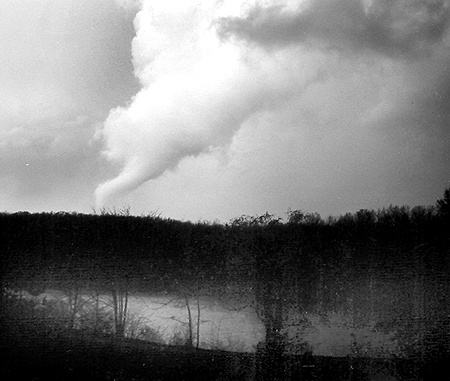 Bruce Township resident Jeanne Morris took this photo May 5, 2003 from her home on 33 Mile Road between Fisher and Dequindre. Morris said that she watched this tornado form shortly before 8 p.m. and apparently touch the ground briefly before dissipating. A funnel cloud blew through the Romeo area during a thunderstorm Monday evening. The funnel cloud apparently touched down just before 8 p.m. in Addison Township ripping the roof off a house, breaking tree limbs and downing power lines in the vicinity of Rowland and Rochester roads, just south of Leonard. "It had a lot of force but it was sporadically applied," said Addison Township Fire Chief George Spencer. A storm assessment team from the National Weather Service office in White Lake Township was investigating the scene Tuesday morning. "It¹s probably a tornado based on the photographs and videos that we¹ve seen," said National Weather Service meteorologist David Koelher. There were two more sightings of a funnel cloud shortly after the Addison Township tornado. Firefighters from the Bruce-Romeo Fire Department spotted a funnel cloud over Chase Farms and Springbrook mobile home park near the intersection of 33 Mile and Van Dyke. "They said that there was no doubt that it was a funnel cloud," said Bruce-Romeo Fire Chief Floyd Shotwell. Ray Township Fire Chief Jim DiMaria said that a resident had spotted the funnel cloud near 30 Mile and Omo Road. There were no reports of tornado damage in Bruce or Ray townships. Nagemaakte horloges. | Een kopie van horloges. | Nagemaakte horloges.